The Cwmdu Inn bar and restaurant are managed by David and Jenny who provide a warm welcome to the pub for all our customers. Our draught beer is mainly supplied from the Llandeilo based Evan Evans brewery with it’s range of award winning ales. We have guest ales from other local breweries on occasions as well as a great selection of ciders and bottled beers. Whilst we aim always to offer beers, cider and other drinks produced locally or in Wales we do endeavour to ensure that other tastes are met with drinks such as Guiness, Newcastle Brown, Speckled Hen and Carlsberg to name a few. We also stock a good range of soft drinks and non or low alcohol beers / larger. Pub meals are served every *Saturday evening from 7-9 pm, each week will have a different menu but our chefs ensure that they regularly put on some of their traditional favorites. If you’d like to book a meal, phone the pub, post office and shop on 01558 685156 and see our What’s on page for special additional events. How about hiring the Inn for your upcoming event? 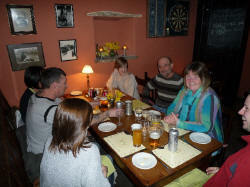 Cwmdu Inn is available for hire, it has a professional, well stocked kitchen for private use or we can cater for you. The restaurant seats 17 comfortably or can be arranged to suit your requirements. We have a further dining room upstairs which will seat 16 people. Cwmdu Inn Quiz Night Friday 26h April 7:30 p..m. No entrance fee. Come along with a team or join one when you arrive. You are very welcome. We look forward to seeing you and your group at some time next year, better weather and longer walks – of which there are plenty around here. Hi are dogs allowed in the pub please? Grateful for a menu for our visit on Saturday 17th. Thank you. Thank you. The menu looks great. Do you have a gay night for gays ? Everyone is welcome any night we are open. If a group would like to arrange a special session at any other time then get in touch and we’ll do our best to accommodate you.